One of the great ironies of the year 2018 may very well be that while the ever so mighty United States descended into political madness, its “underdeveloped” neighbor to the south is poised to rise up to give the world a lesson in political sanity. Drowning in the blood of a decade-long “drug war,” slandered by the orange emperor in Washington for exporting migrants to states bearing names in their language (Nevada, Colorado, California, Arizona, Texas) , Mexico will vote for president on July 1st. Make no mistake, Washington, D.C. and right-wing regional governments will all cast their gaze on Mexico in two months. The reason for their inordinate interest has a name: Andres Manuel López Obrador, known to friends and foes alike as the acronym AMLO. 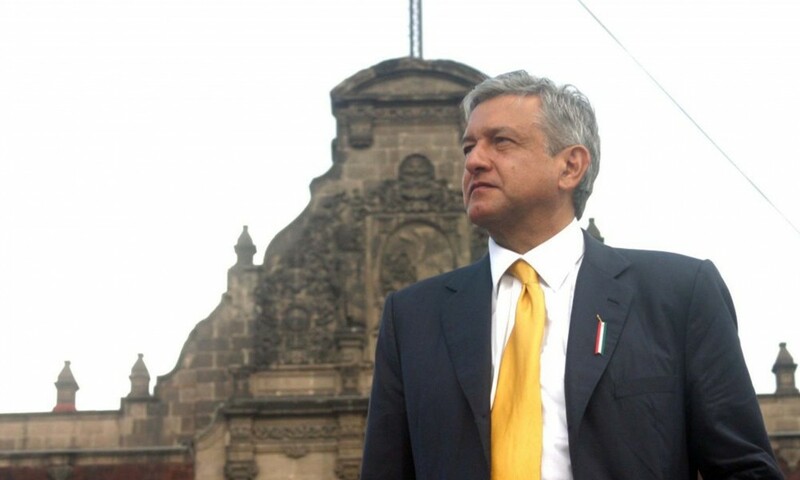 Long the face of an electoral leftist alternative in Mexico, AMLO is making his third bid to become president of the Aztec nation. It took the complete implosion of Mexico’s institutional political system to finally pave the way. After serving as governor of Tabasco, then mayor of Mexico City, and gaining fame for his fiery, populist spirit, AMLO first ran for the presidency in 2006 under the banner of the PRD (Party of the Democratic Revolution), a sort of Mexican version of the British Labour Party, until its cadres began selling out to neo-liberal economics. For a while it was the key alternative to the PRI (Institutional Revolutionary Party), which ruled Mexico with hegemonic force since the end of the Mexican Revolution in 1920 until 2000, and the right-wing PAN (National Action Party). It was not to be and AMLO lost in one of the great rigged elections of modern times to Felipe Calderon, a boring bureaucrat tapped by outgoing, cowboy president Vicente Fox. AMLO led weeks of protests which rocked the Mexican capital as he demanded a recount, to no avail. History has proven in bloody fashion it is sometimes best to wait. Calderon soon declared a drug war in which he unleashed the notoriously corrupt military into large swathes of Mexico to essentially (in theory) mop up the drug cartels selling narcotic goodies to the eager buyers of suburban America. The result was a shattering of Mexican society as drug gangs fractured, major cartels went to war and it soon dawned on many that the army itself is a tainted institution. Twelve years later, the country remains a butcher shop with 25,339 homicides recorded in 2017. Out of a population of 127 million, 55 million live in poverty. In 2012, PRI pretty boy Enrique Peña Nieto was elected (with AMLO again losing) on a platform of bringing down the murder rate and expanding Mexico’s journey towards glorious, capitalist reformation. Time Magazine heralded the Mad Men-style Nieto on its cover with the enthusiastic banner headline, “Saving Mexico.” Incapable of understanding the countries they bomb, gringos also have an amusin inability to understand their next door neighbors. After a six year term which featured everything from the capture, escape and re-capture of El Chapo Guzmán to the notorious murder of 43 student activists in Ayotzinapa (still unsolved), Peña Nieto now leaves a Mexico with a rising murder rate, disappearing students, bullet-riddled journalists and broken economic promises. While biding his time, AMLO has stayed busy, founding MORENA (National Regeneration Movement), described by many observers as the most exciting political party to emerge in the Western hemisphere since the Sandinistas. Akin to Syriza in Greece or Podemos in Spain, MORENA is an example of post-millennial leftist parties attempting to organize in a post-Cold War, post-modern world. In Latin America, the timing is particularly delicate. Rightward-leaning Latin American political parties and governments have been on the rise in Argentina, Chile, Colombia and Peru throughout the last two decades. The Bolivarian experiment in Venezuela is fracturing under the combined weight of an inexperienced, naive leadership nucleus and a U.S.-led economic war. The latter is bolstered by a spurious and masterfully executed propaganda campaign that exaggerates instability in Venezuela and effectively muzzles any news coverage that addresses the overwhelming evidence of conservative political opposition involvement in the violence that has led to instability there. It speaks to how much of a comedy history can be that, just as South America begins tilting to the right, Mexico—an undeniably vital U.S. trading partner and a key state among Latin American countries—veers to the left. Yet the timing could not be more perfect. AMLO is the necessary, feisty politician who represents the possibility of bringing some semblance of social democracy to Mexico while facing down the ranting, hot air balloon known as Donald Trump. The Mexican ruling class, including its ossified intelligentsia, has been completely caught off guard by both the Trump regime and the rise of AMLO. Soon after Trump was elected, Nieto went so far as to invite the global pariah to visit Los Pinos, then rushed to cancel the welcome when he realized the Mexican people would have none of it. Centrist intellectuals like Enrique Krauze lament the disappearance of students, attack Trump in the journals yet accuse López Obrador of “authoritarianism.” The PRI and PAN have taken queues from the Democrats and have attempted to imply that AMLO’s campaign is being pushed online by those pesky Russians. Jorge Ramos, acting like a total pendejo, badgered AMLO on TV with prehistoric questions about whether Cuba is a dictatorship or not. AMLO responded with a tough and rational tone, reminding Ramos that Mexico has a long tradition of honoring other countries’ right to self-determination. So what is going on? Like the United States, Mexico has spent years building a system of power in which elites run the levers of government and economy under the guise of democracy. Throughout the upheavals of revolution, social change and economic highs and lows, the character of the Mexican aristocracy, proud of the Castilian blood coursing through its veins, has never changed. Now the ruling class is being confronted by a populist candidate who has moderated his tone to the level of a Tabasco-bred Bernie Sanders. He is not proclaiming the 5th International (as Hugo Chávez once attempted to do), despite this year marking Karl Marx’s 200th birthday, and he hasn’t threatened to nationalize the estates of Carlos Slim and his buddies. Instead, AMLO is proposing an amalgam of regional reforms mixed with European-style social democracy. He wants to focus on increasing education for the masses, tackle corruption in what he calls “the mafia of power.” As Trump threatens to scrap NAFTA, AMLO seeks to begin putting controls over a market economy that has left the poor behind. The Mexican mainstream press (highly controlled by the oligarchy), and right-wing U.S. outlets are horrified at AMLO’s proposal that one way to tackle crime is to grant amnesty to lower level criminals, those arrested for minor offenses. In his view social rehabilitation is a must in modern-day Mexico. Even Alejandro Ramírez, owner of the major movie theater chain Cinepolis, tells Bloomberg that, “We’re in complete disagreement with the insults López Obrador used to refer to us.” One can imagine what Mr. Ramirez says about López Obrador behind closed doors. Unfortunately, the elite is stuck with two other duds for candidates, Ricardo Anaya ( PAN) and José Antonio Meade (PRI). Anaya carries on like some Silicon Valley hipster and Meade is about as exciting as the boss everyone at the office hates. With 48 percent of Mexicans polled leaning towards AMLO, the stakes are high. We here in the U.S. must watch closely. As the imperial power grapples with a demagogue dipped in gold, Mexicans are sweeping aside the old order democratically by swinging left. After July 1, the real battle will begin as López Obrador will inevitably be forced to grapple with the leviathan Mexican system. Like Salvador Allende in Chile, he will attempt to domesticate a violent social order through the practice of democracy. If the Mexican masses pull off a great victory, then this could give a much needed breath of fresh air to popular forces in the United States. Immigrant groups, workers’ groups and activists should look to what is happening in Mexico, where identity politics are an issue, but the very realities of class war are at the forefront. Americans will surely be pulled into the arena when AMLO first comes face to face with Trump. Luckily for Mexicans he has the ideal thick skin and temper to stare down the blonde train wreck that would be emperor. The Mexican elections have more global importance than one could imagine at first glance. Fascist parties are on the rise in Europe, rumors of a great coming war are persistent in the Middle East, and in the U.S., politics are quickly turning into a vicious, paranoid circus. But just as our president dreams of building great walls along the border, the winds of change from down south may be too strong to hold back.